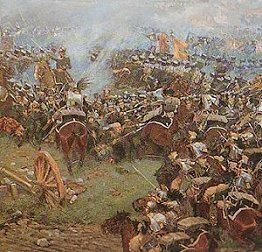 7,000 Prussians killed and wounded Wellington's army: 3,500 dead; 10,200 wounded; 3,300 missing. 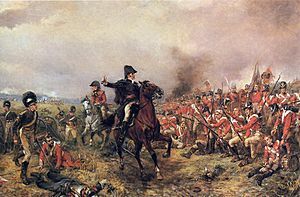 The Battle of Waterloo was a battle that was fought mostly between French and British forces. Napoleon was crowned as Emperor of France in 1804. Then he launched many successful attacks on other countries in Europe. France soon had an empire that stretched from Spain to the Russian border. The only country that was still not captured was Great Britain. The Royal Navy had many ships, so invasion by France was not possible. However, Great Britain was not strong enough to stop Napoleon and his army from taking over most of mainland Europe. Napoleon seemed unstoppable until two separate campaigns caused his empire to fall apart. He gathered a huge army to invade and conquer Russia once and for all in 1812. However, he did not think that he would have very many difficulties and it turned out he did. His army was caught by the Russian winter and destroyed by the weather and lack of food. By 1814, he faced total defeat, with the Austrians and Prussians invading from the east and the Duke of Wellington and the British army in the west. A peace treaty was arranged. Napoleon would abdicate (give up the throne) and be exiled to a small Mediterranean island called Elba, with a small army. He was replaced as ruler of France by Louis XVIII, brother of Louis XVI. Once he was on the island of Elba, Napoleon was really not happy. He had been promised money by the new French government, but the money did not come. His wife (an Austrian princess) and his sons were forbidden to visit him. Messages from France showed that the new French King was unpopular because he was trying to ignore many events that had taken place during the revolution. The allies that had united against Napoleon were arguing in Vienna over the lands that they had recaptured. He seized his opportunity, going by ship in February 1815 and landing in France again. His welcome was very mixed. Many French were tired of war and the death and suffering that it led to. However, there were others who wanted a return to the power and glory of the old days and saw Napoleon as their best hope. What Napoleon needed now was a period of time to organize himself and the French army. The allies were caught completely by surprise and their only chance to stop him lay with two small armies in Belgium: a British and Dutch army commanded by the Duke of Wellington and a Prussian (German) army commanded by Marshall Blucher. At 11.00 Napoleon ordered his guns to open fire. French infantry began an attack against the Château of Hougoumont, defended by the British Foot Guards. This was intended to draw Wellington’s reserves away from the centre, where Napoleon’s main attack would fall. And according to records this battle was considered to be a vital key to who will win the Battle Of Waterloo. At 13.30 Napoleon launched an infantry attack against Wellington’s centre. Men of the King’s German Legion resolutely defended the farm of La Haye Sainte. This disrupted the French attack. British artillery and musketry succeeded in repulsing the French assault and the British Household and Union heavy cavalry brigades charged after the retreating Frenchmen. Elated by their success, the British cavalry pursued their enemy too far and in turn suffered terrible casualties at the hands of the French lancers. At 15.00 Marshal Ney, believing the Anglo-Dutch army to be retreating after the heavy bombardment they had received all day, led a massed French cavalry attack against Wellington’s centre. However, the British infantry, forming squares to defend themselves from cavalry attack, held firm. The French took terrible casualties as they circled these impregnable formations of infantrymen. The situation further deteriorated for Napoleon as Blucher's Prussian troops launched an attack at Plancenoit to his rear at 16.30. At approximately 19.30 Napoleon committed his last reserves in a final effort to obtain victory. As Prussians arrived to bolster Wellington’s flank, veterans of the French Imperial Guard advanced to 'finish the job'. The British infantry, exhausted from the continuous cannonade they had received all day, rose to meet them. 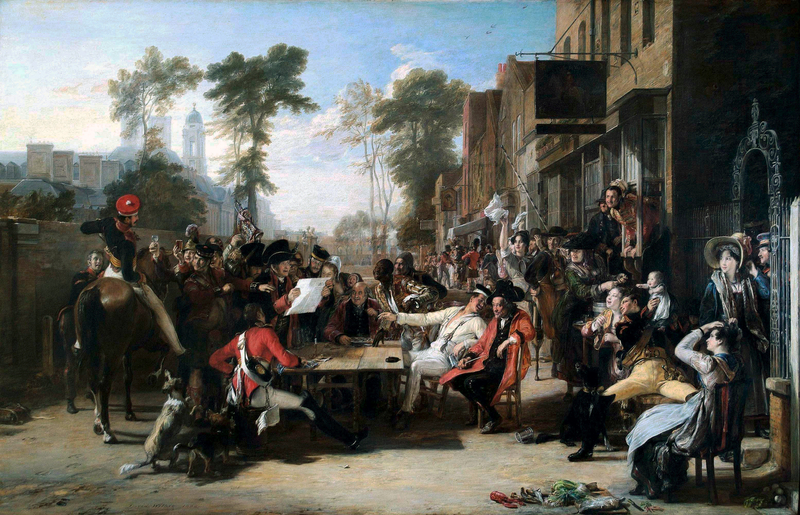 The musketry of the British Guards Brigade defeated Napoleon’s finest troops. They fled, and the whole French army joined them in retreat. Wellington ordered his entire line to advance and the French were chased from the field. Battle of Waterloo Facts for Kids. Kiddle Encyclopedia.